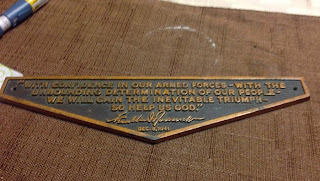 Submitted by Mike: I recently purchased this Franklin Roosevelt plaque and was wondering if you Could help me find out where it may have come from. There are no markings on the Back. Any information will be helpful. If you can help Mike please click on the comment button.